As my little post last night mentioned, I’m re-doing the layout of the site. This new theme will require a lot of learning on my part, so it may be a while before you all see the final product. What I’m hoping is that I can change the color scheme of the blog as the seasons change to get people more in the mood. I’m not sure if that’s the best idea yet, but we’ll see. If you follow me on Twitter, you may have seen that I was smoking a turkey earlier in the week. In Hawaii, people would probably refer to it as “kalua turkey”. Since it was a 16 pound turkey, we have a lot of meat left even after two days of eating and me taking some to our monthly potluck. 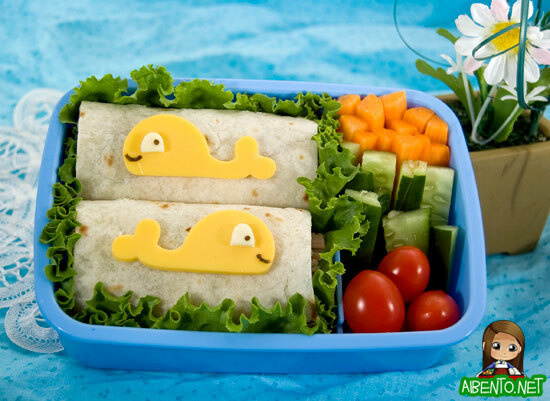 Thus, I’m eating smoked turkey wraps today topped with little cheese whales. Notice anything new with my photos? I’ve decided I’m sick of typing out “Adventures in Bentomaking” on all my photos and instead, I’ll now stamp them with a little logo that includes my url. So now instead of being sick of my text, I can be sick of my little graphic stamped all over the place. My lightbox is currently full of junk that I use to take photos with that I can’t seem to find room for anywhere else. It’s getting really crowded and I have lots of things in complete disarray such as all my background materials, which all badly need ironing. In this case though, the wrinkled blue looked like an ocean, so that worked out great. I wrapped the turkey with some lettuce and cut it in half, trimming off the end. 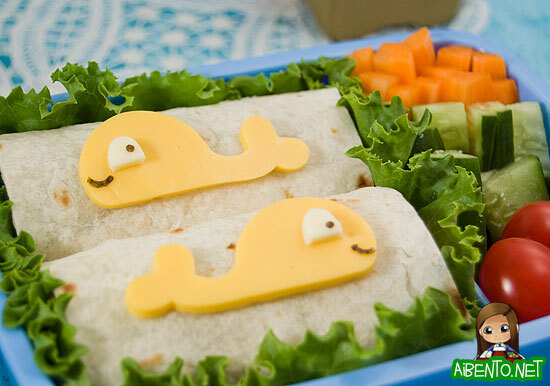 I used a whale food cutter I got at From Japan with Love and cut out two whales from a slice of cheese. I cut a piece off of a thick straw and pinched it to make a thin oval. I cut that in half to make the eyes, then added punched nori as the eyes and mouths. I was going to add black sesame seeds for water spouting out, but I couldn’t find them. Haha! On the side, separated by a divider, I have some fresh veggies: baby carrot sticks, cucumber sticks, and some small grape tomatoes. It was very simple to make, taking me only about ten minutes. If you use lettuce leaves as a ruffled border, make sure you dry the leaves with a paper towel so that you don’t get water in your tortillas. Also, don’t buy beautiful, but extremely sour grape tomatoes. Yech! Anyway, I bet you want to know how to make smoked turkey because it just sounds so good, right? To make your own smoked turkey, you need a special smoking mechanism called an oven. This is a great recipe for when you need to let off steam, cause you get to stab holes in the turkey. 1. Remove insides from the turkey. 2. Open up bag and place in roasting pan. Place turkey inside. 3. Rub with sea salt and pepper. Pre-heat oven to 250. 4. Take knife and stab turkey repeatedly. Do not stab self. 5. Pour liquid smoke on turkey a little at a time, rubbing into the skin and in the cavity. 6. Seal bag with enclosed tie and poke holes in the bag for ventilation. 7. Roast turkey for 8 hours. 8. Once done, let cool for a bit and then pull apart meat. Shred meat for easy eating. 9. Pour juices into the container and let the meat soak. You’ll need to drain the turkey well if you’re making wraps while the meat is hot, as there will be TONS of liquid and that makes for sloppy wraps. Happy eating! Yesterday Buddy informed me that he has a girlfriend at preschool that he plays puzzles with. At least he’s going slow, unlike Baby Girl, who eloped in preschool. He recently turned four, which caused me to stand back and think, wow, has it really been four years since I was last preggers? I may complain about him, but he’s really a big bright light in all our lives. Yesterday, we were in a pet shop and ‘Bad Romance’ starts playing and he yells at Baby Girl, “IT’S LADY GAGA!! !” His musical knowledge doesn’t end there. On the way home yesterday he starts singing, “I’m a single lady! I’m a single lady! I’m a single lady! I’m a single lady!” I asked him who sings that and his reply was, “The Chipmunks!” HAHAHA!